Peals on the bells greeted Mr Roger Brindley Wise, younger son of the late Mr and Mrs C Wise of 'Underborough' Westward Ho! and his bride, Miss Margaret Rosalind Tucker, eldest daughter of Mr and Mrs S J Tucker of Babeleigh Barton, Parkham, after their wedding at St James' Church, Parkham. The bride is a member of the Stevenstone Hunt and was a member of the Stevenstone and Torrington Farmer's Pony Club. 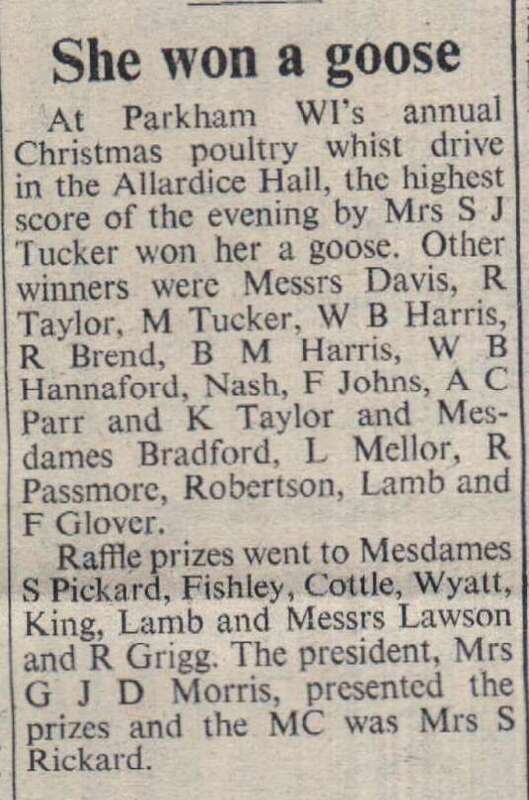 At Parkham WI's annual poultry whist drive in the Allardice Hall, the highest score of the evening by Mrs S J Tucker won her a goose. Other winners wre Messrs Davis, R Taylor, M Tucker, W B Harris, R Brend, B M Harris, W B Hannaford, Nash, F Johns, A C Parr and K Taylor, Messdames Bradford, L Mellor, R Passmore, Robertson, Lamb and F Glover. 'Ride that cow, cowboy' might well be the cry heard these days at Hawkcan Acres, Parkham, when George Clinch decides to go riding. Young George jumps at every opportunity to ride Griffiet - so called because his father was called Griffian and her mother, Harriett. Homebred, she has a name like all the 60 or so cows that George's parents Mr and Mrs Stan Clinch keep on their farm. Bideford area athletic sports for the smaller primary schools was held at Instow Cricket Ground. Hero of the day was C Allin of Parkham who set a new record in the 11 year olds cricket ball throwing. The winning school was Monkleigh, followed by Parkham, Abbotsham, Westleigh and Horwood and Newton Tracey. Mrs W Scott, headmistress of Horwood and Newton Tracey C.P School presented the cup. An archway of oars was formed by fellow members of Bideford Amateur Rowing Club at St James’ Church, Parkham, on Saturday to greet Mr John Hutchings, youngest son of Mr and Mrs F Hutchings, of Beachside, Torridge Place, Bideford, and his bride, Miss Sylvia Wendy Smale, eldest daughter of Mr and Mrs S Smale, Goldworthy Cottage, Horns Cross. Peals on the bells also greeted the couple. The four tier wedding cake made by the bride’s godmother, Mrs Eileen Tucker, was iced in the BARC colours. Second prizewinners in the adult class in the fancy dress parade that has become a big feature at Parkham Church annual fete. Depicting the ‘Good old days’ and the TV feature of that title are Mesdames A Daniels, W Jewell, E Gist and Westlake. There was a large entry in all three classes and proceeds from the fete topped £100. Other winners were: Misses Lilian Metherell and Isabel Johns; Mrs Pearl Dunn; Paul Metherell; Martin Wonnacott; Alan and Brian Hockin and David and Graham Parr; Heather Johns; Marilyn Wonnacott, Caroline Judd, James, Sally and Mary Dendle; Angela Honey. For over 20 years a Parkham District nurse, Mrs Isabella Melvin, SRN, SCM, a Queen’s Nurse, of ‘The Bays’, Horns Cross, died on Friday at the age of 60. Mrs Melvin was the wife of Mr Wilfred Melvin, and had lived in the parish for 23 years. Her services were deeply appreciated and she will be mourned by many as a friend. The memorial service in St James’ Church, Parkham, was conducted by the Rector, Rev J E Lynn, and Mr M Chubb was at the organ. Cremation was at Colwyn Bay, Denbighshire. Teams of bell ringers from an area embracing Bradworthy, Northam and Torrington joined, in turn, in ringing celebration peals on the bells of St James's Church, Parkham, following a special service to mark the re-hanging of the bells. Mr Stanley Arnold (Rector's warden) of the Bell Inn, undertook the duties of appeal secretary. Visiting clergy included Revs S L C Mallett (Dean Rural and Vicar of Bucks), L Woolcott (Buckland Brewer), G W Colborne (Alwington), W T H Ravenhill (Sutcombe) and C Garland (Putford). The Sunday School anniversary services have been duly observed by the Wesleyans of Holwell. This is generally the last to be held in the neighbourhood. The outlook for the corn harvest is much better since the recent good rain. In many instances the spring corn was behind owing to the continuous dry weather, and some through rather late tilling, and the root crops were also suffering for the want of rain. A potato weighing 1½lbs has been dug by a cottager recently. The specimen was Early Puritan. Parkham Women’s Institute, thought to be one of the oldest organisations of its kind in the Torridge district, celebrated its 50th birthday with a special party at which a cake was cut by Mrs W Pridham, who was a founder member, and Mrs A Daniel, the longest active member with 48 years’ service to her credit. The cake had been made and decorated by Mrs E Lang. 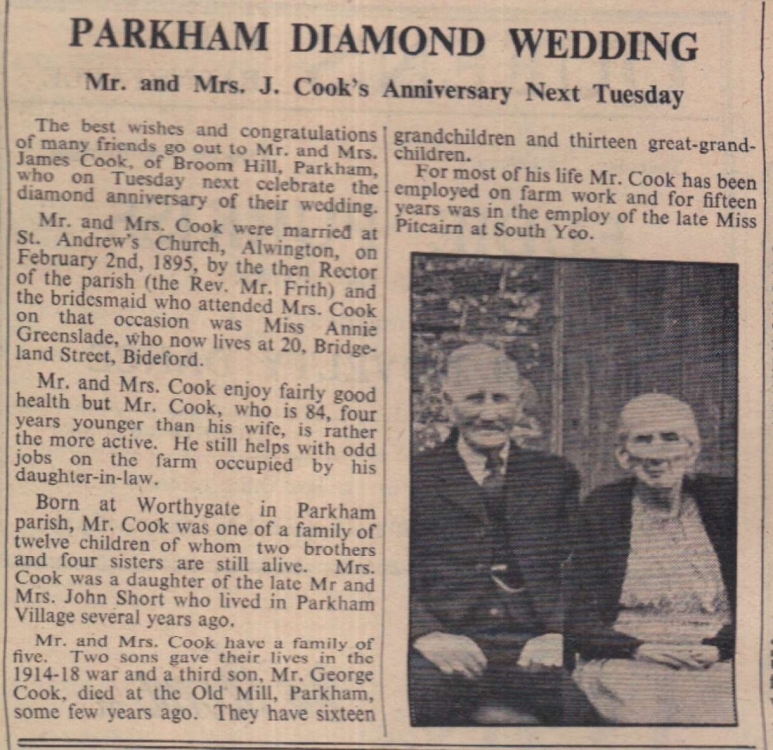 The best wishes and congratulations of many friends go out to Mr and Mrs James Cook, of Broom Hill, Parkham, who on Tuesday next celebrate the diamond anniversary of their wedding. Mr and Mrs Cook were married at St Andrew’s Church, Alwington, on February 2nd 1895, by the then Rector of the parish, Rev Mr Frith, and the bridesmaid who attended Mrs Cook was Miss Annie Greenslade, who now lives at 20 Bridgeland Street, Bideford. What promises to be one of the most attractive parish halls in the area is now well on the way to completion next door to the village school at Parkham. 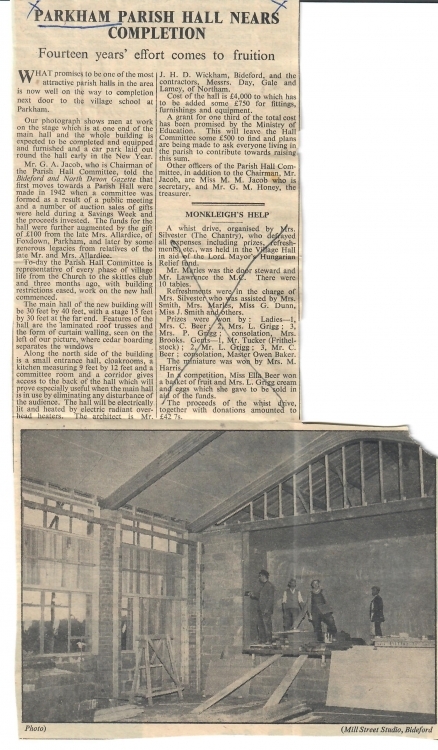 Mr G A Jacob, who is Chairman of the Parish Hall Committee said first moves towards a Parish Hall were made in 1942 when a committee was formed as a result of a public meeting and a number of auction sales of gifts were held during a Savings Week and the proceeds invested.